Many of you have written to my Brother-the-‘Bug with requests for advices about behavior issues. In a way, we are relieved to hear that so many of you are having behavior issues, since both my ‘Bug and I have some things that we’re working on too. For instance, did you know that my ‘Bug sometimes gets so worried about bicycles or motorcycles or joggers whizzing by that he wants to leap out and punch them with his teeth, to tell them to go away? Yep, it’s true! But he’s working on it, and I’m very proud. My brother’s excellent advices a couple of weeks ago about your behavioral issues were that you need to find a good, reputable, experienced trainer in your area who can meet you in person and help you. But we put our handsome, handsome heads together and got to thinking: some of you may not know how to pick the very best trainer, so here are our ideas on what to look for and how to get started. This list does not include everything, but just our favorite things to think about when thinking about dog trainers. 1. What can you find out through research? These days, any ol’ Chick or Doodlebug can hang a sign outside his door claiming to be a Professional Dog Trainer or even a Behavior Expert. There is no regulation and no certification of this profession! So just because somebody says they are a professional or an expert doesn’t actually mean anything. Yikes! Look at the person’s website. What are their credentials? How long have they been in the business? Can you find any reviews of their services in your local paper, on Yelp!, or elsewhere on online forums? Do you know anybody who has used them with success? A dog trainer with little or no public info available and with no published references or recommendations may be an excellent trainer, but tread with caution — you can’t know for sure what you’re getting! And that’s a big risk for any serious behavioral issue! 2. What are their affiliations? Are they certified by any official governing body? Those fancy letters after some trainers’ names may mean that they have put in hundreds of hours of learning, have years of training already under their belt, and have taken a standardized exam to prove their knowledge and commitment to humane training methods. But other fancy groups of letters don’t mean much at all! APDT, for example, is a membership group that any individual interested in dog training can join. Pay a fee, and you’re in. It says nothing about an individual’s qualifications to work with dogs. My brother’s certification is CGC, which means he passed a test of good behavior, but it doesn’t make him qualified to offer advices on your behaviors! And my certification is GDG (Gosh-Darn Genius). It’s an elite title, but also does not make me an official expert! Other certifications come from private training clubs or programs, ranging a great deal in depth and duration — some programs offer just two weeks of instruction and gift students with a certificate! So before you let yourself be impressed by an affiliation, do your research — here is a good place to start. 3. What motivators do they use in training? A trainer who uses fear and intimidation (shock collars, collar jerking, squirt bottles) should send you running in the opposite direction. One who primarily uses food is fine, but it’s best to find one who uses a wider variety of positive motivators — praise, attention, toys, and fun. 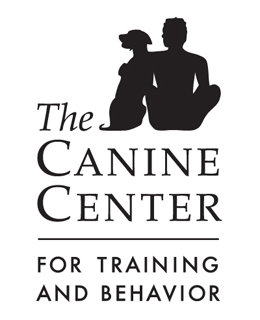 My favorite place to learn (and I am biased, I know) focuses on the relationship between dog and person, even before addressing behavioral issues straight on — they are linked, after all. Many dogs who come in as behavior cases first spend days or weeks working on fundamental relationship issues with their person like trust, positivity, and fun, and only then move on to addressing the specific behavior that brought them in from the start. 4. In behavior cases, do they look at the whole dog? I’m not talking about a dog’s tail and underbelly and ears — though those are important too. Jumping right in to a “fix” for a behavioral issue can be dangerous. In your first meeting with the trainer, be cautious if they don’t ask a lot of questions — even questions that don’t seem relevant. A good trainer should be interested in a dog’s physical appearance, behavioral and medical history, diet, relationships, and home behaviors — not only the immediate issue the owner is worried about. In countless cases, what looks like one issue to the casual observer can turn out to be caused by something seemingly unrelated. An experienced, sophisticated trainer will look at the big picture. 5. Are the dogs and handlers having fun? If still in doubt, ask if you can sit in on a group basics class. 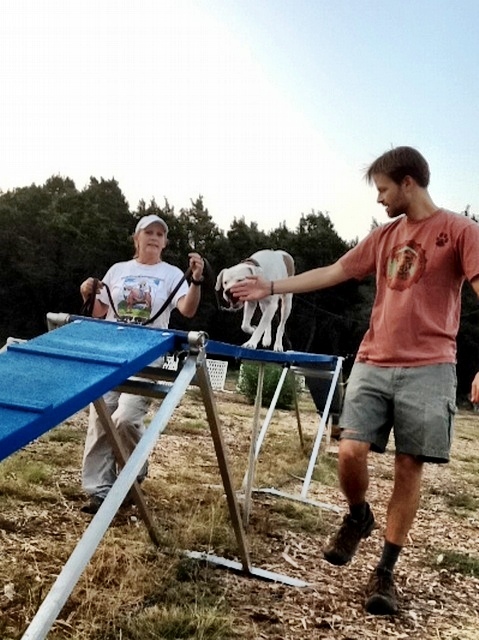 Do the trainer, handlers, and dogs look like they’re having a good time? If dogs are being bullied, forced, or yelled at while learning how to walk on leash or perform a “sit,” you might want to keep looking. Learning should, for the most part, be fun. If a trainer isn’t working with her clients in a warm, engaging way in a group setting, there’s good reason to believe that private consultations and lessons will involve the same bullying, force, and yelling. And you don’t want that. Of course, there are many more important criteria to consider when selecting a trainer for your dog — the Association of Pet Dog Trainers has a nice web page about this topic here. When you’re ready, you can search for a trainer here. And if you’re in the Austin area, please come to the Open House (party!!) 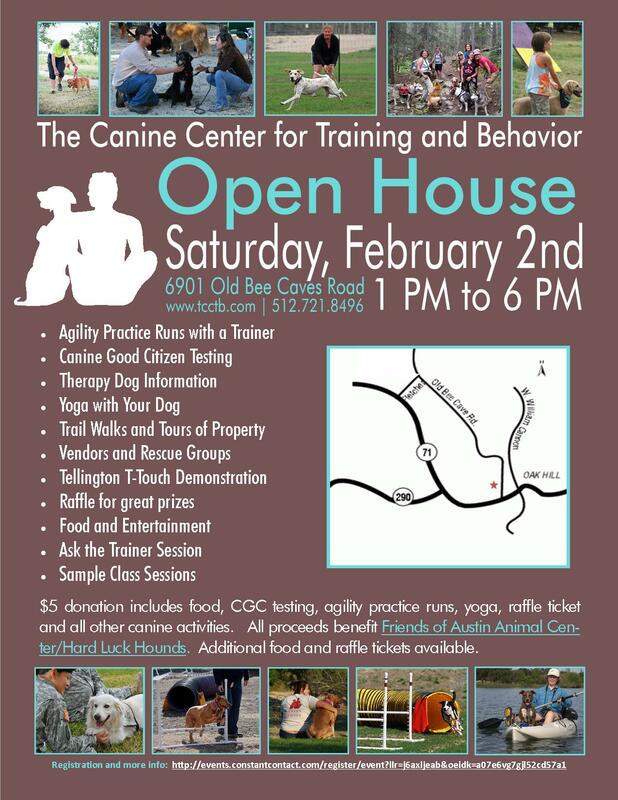 at the Canine Center for Training and Behavior, where mama, the ‘Bug, and I, work and play, tomorrow (February 2). We’ll have training demos, yoga, agility, food, music, balloons . . . a good time for everybody! man do I wish I lived in Austin! Any good DC/MD trainer rec’s? Have fun at the open house tomorrow, Chick! You know I am a GDG, but that doesn’t make me a dog trainer! Dear Chick, let Bug know that my pup Petey had a thing with bicycles (which is a problem in NYC) and trying to punch with teeth. I think though it was more about flinging his body…anyway… with some corrections he grew out of it. Thanks for the link to the article on trainer certifications and what all those letters mean. That is helpful. We have a good trainer that we can talk to for specific issues (she is going to help us learn how to play nicely with other dogs), but still are looking for someone for basic training classes. What I have found in the classes I’ve observed is that people are at extremes – either all treat training, or all correction training with absolutely no treats. Hard to find someone who strikes the balance with treats, toys, play, etc. Thanks for your post! All fantastic things to think about when finding a trainer! My foster sister Sophie has lots too much fun when training comes into play, actually… she has way too much fun all the time. So, the momma is going to take her to some training classes (unless she gets adopted before they can start, then she’ll require the training classes for her adopter) because the momma has never experienced anyone as wiggly and difficult to train as Sophie! Not that she’s difficult to train, but treats, affection, toys… none of it works and the momma doesn’t want to start heading in the wrong direction. She’s making some progress, but it’s really slow and the momma doesn’t think she’s doing all the right things possible. She says, sometimes it’s good to take a step back and ask for help! Great tips, Chick! Spoken like a true expert. You have seen and heard a lot in your time and I am glad you took the time to share your perspective. Hopefully this advice will go on to help many other dogs and their humans. Good luck with the big event tomorrow. It sounds like it’s going to be a blast and I hope it’s a huge success! Thanks, Chick! We’re hoping we’ve found a great trainer for our separation anxiety boxer, we’ll know more in a few weeks when she comes over! Our vet recommended her to us. One thing we’re wondering – how much should we expect to be paying? Is that cool to ask? There seems to be a bit of variety in people we’ve found, so we’re not sure how much is too much (or if helping our girl is just priceless). PS – Love the shot on the tennis court! 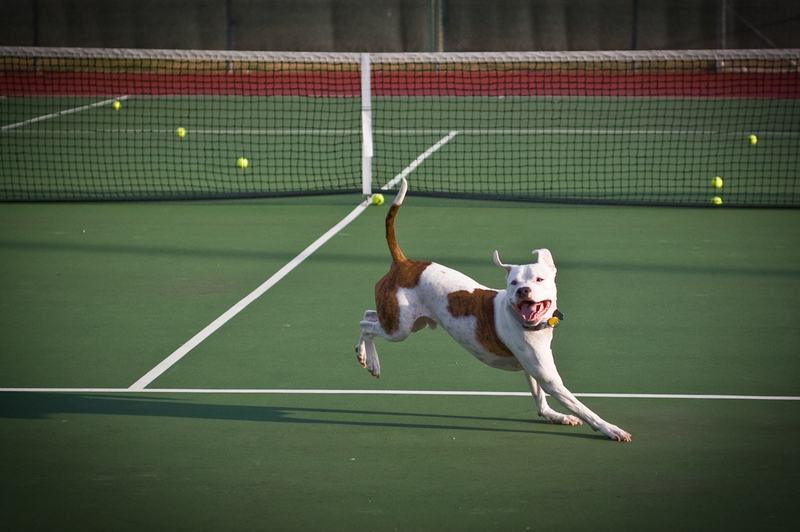 Our other boxer would looooove to find a deserted tennis court to get some zoomies out and chase those balls around. Cost depends on so many things. A top-notch behavior expert with a lot of experience can run $100+ per hour. Your Open House sounds FANTASTIC and so fun : ) Wish we could attend but we live in Seattle. Have a wonderful day! I second the comment about the photo on the tennis court — peak action and beautiful! 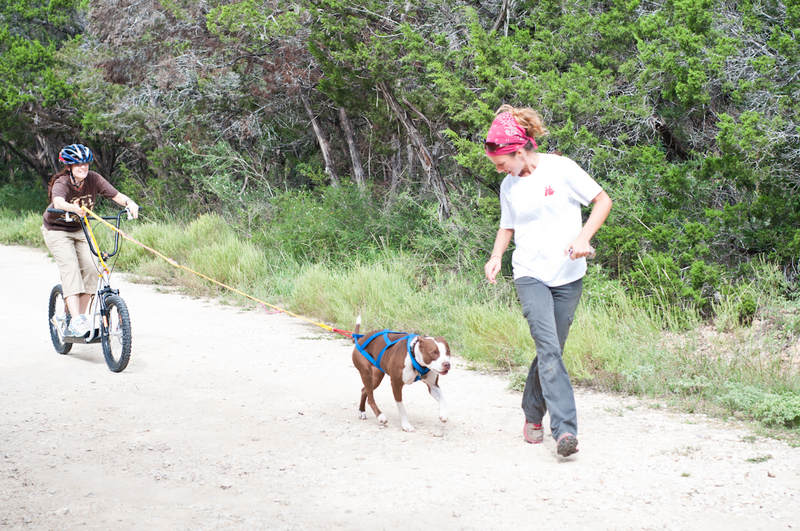 For us rescued and owned dogs here at Silverwalk, our mom watches us interact – a lot. Some of us respond better to toys (Justus) but most like treats – most of us are hounds, so food is very important. The Mom reads all your posts, both yours, Bug’s and your Mom’s, cause she wants to do the best for us which is sometimes hard cause she’s outnumbered- hehehe. A trainer friend two of us will see this afternoon specifically trains for the dog, not the breed. She takes her time to get to know us (she worked with Mami and the puppies plus more), then offers suggestions after a thorough discussion with the Mom. Later, gators! Have a great weekend and thanks again for the advice. Hi, you mention no shock collar – agreed. But what do you think about a beeping collar? I use positive reinforcement and in home training sessions. My 1 year old guy is GREAT on leash and outside the home on walks, greating other dogs and listening to commands. His issue is when company comes into our home. He jumps and nibbles – not out of aggression but anxiety – & at 65 lbs this can be quite painful for 5 year old visitors. I have been using a beeping collar. He gets 1 chance to listen “off” or “leave it” & then he gets a beep. He doesn’t like the beep and steps away, then a treat and a love. We are making huge progress with home visitors. Thoughts?